Every once in a while someone wonders how they can look like they know something and have compiled information without doing the real work, so they hit answering-christianity.com, or some similar and find exactly what they were looking for. Or so they think. Sorry, I couldn't help but comment. Paul was a missionary; his job was to convert Gentiles, pagans, idol worshippers, w/e to Christianity, not to make Jews out of them. Muhammad didn't make Jews out of Arabs either. Jesus actually said the Sabbath was created for man, not man for the Sabbath. In its context, which is more than three (not in the verse) words, Jesus was refuting the Scribes and Pharisees for their criticism of the disciples who weren�t fasting on the Sabbath, were picking corn on the Sabbath, and His curing a boy with palsy on the Sabbath. According to the Pharisees and scribes all this was unlawful yet Jesus did and allowed His disciples to do these things on the Sabbath. How does that interpret to �Keep the Sabbath�? The same as your reference to Luke 2:21. Jesus was 8 days old and circumcised. Was this by His own orders? What child has authority to say or do anything about it at 8 days old? This is not a command of Jesus but a record to show He was circumcised, as were all Jews according to the law given Moses. Paul merely brought out the logic. If you are circumcised yet do not follow the law what good is it to you? If circumcision was the only way to heaven then every American soldier will be there. Paul cautioned his people more about UNcircumcising themselves through their other sins. See how context makes a difference? This is a total misrepresentation. Wow, if anyone screwed up the Quran like this you�d be all over them. This is the corruption of the Bible right here. It�s called Muslim manipulation. The Quran warns of this, Muslims think it was way back when. It still happens. Where is the word baptized used in this passage and in what translation? None. There is no reference to baptism here at all. What does it make reference to? Rebirth. Ye must be born again. By the logic you propose we were all baptized when our mother�s water broke. The point Jesus was making was a spiritual awakening, a rejuvenation of the mind by the Holy Spirit of God. At least Paul knew what Jesus was talking about. Romans 12:2 Paul says; And be not conformed to this world: but be ye transformed by the renewing of your mind, that ye may prove what is that good, and acceptable, and perfect, will of God. Please do me a favor and read 2 Chronicles 7:12 � 16 and tell me where/how it says that. 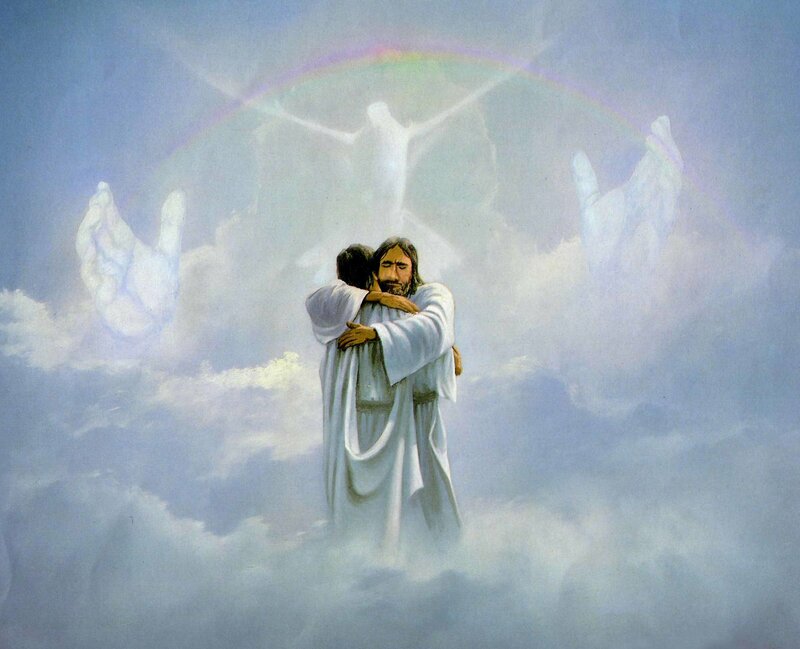 Middle of verse 14 it says �Then I will hear from Heaven� It ends with �My eyes and my heart will be there perpetually. Who are Gods eyes? There are other places in the OT where it speaks of angels in the temples. It would seem by some of the descriptions that these angels were visable. Paul must have been talking about God being in heaven, kinda like God said he was in 7:14. The Law of Mosheh , Musa , Moses says ; It is law that every man - child be circumcised in Genesis 17 ; 10 , Saul , Shaool , Paul says ; You will gain nothing if you are circumcised in Galatians 5 ; 2 . This is just reiterated goop. Now how does this statement made by Paul about a weak Christian have anything to do with some unfounded declaration that you can eat anything? Take note, Baptizeth with the Holy Ghost. Refer back to the conversation Jesus had with Nicodemus. Muslims know nothing of this, nor do they understand. If anything, you use it against yourself. Change the �and I quote� to �and I copy/paste� and you could at least redeem yourself by letting people know you didn�t put this thing together yourself. Anything else you'd like to know about Paul? <FONT face="Times New Roman, Times, serif" color=#000066>Ques ; The Immaculate Conception Of Mary That Christians ( Preach True ) ? Ques ; How Does The Self Apointed� Saul , Shaool , Paul Justify Abolishing The Law ? You are the one asking a question, but you were asked to back up why your question about Paul abolishing the law should be considered valid being that is one of rules on forum to show your source. You show your inferences from certain verses but they are out of context. As for the virgin birth of Jesus, that information was borrowed from the gospel of Matthew; there is no other common or mutual source of that original message but from the uncorrupted gospel. The gospel also gives the reason for His virgin birth, but the Quran gives no reason as to why Jesus had to have been born of a virgin. The law was never abolished; it was fulfilled by Jesus, and through Him, we fulfill the law also; without Him, instead of fulfilling the law, we will be judged by the law! Again You made a claim from the Quran that you did not provide a proof for. This makes us ask question whether you are here to truly learn about Islam or contradict Islam? The Quran does explain why Jesus, son of Mary (alaihi Salaam) was born of a Blessed Virgin Mary and I can show you but I want you to show me because you just made a false claim against the Quran! I actually see it the other way around. That is this thread is making a false statement about the gospel, but I explained to you how the law hadn't been abolished. Instead of going off topic by questioning my motives and speaking for others instead of yourself alone, why don't you show the proof that I said something untrue or made a false claim. Just because a claim is made that you don't agree with doesn't make it false. All I said is the Virgin Birth of Jesus is original only to the gospel along with the reason. I looked for the reason in the Quran and couldn't find why he had to have been born of a virgin. What is the reason for Jesus' virgin birth in the Quran, and why does this appear to offend you? Keep in mind this is supposed to be an open debate. I am learning from your reactions to my comments. Do you want to just have a one sided discussion or debate only? This is not about Paul; he didn't come up with the virgin birth story. This topic is mainly about the virgin birth of Jesus which is original and unique only to the gospel along with the blessed reason. But now that you mentioned it, what are the inconsistencies with Paul? am I suggesting that the law of God is sinful? Of course not! In fact, it was the law that showed me my sin. I would never have known that coveting is wrong if the law had not said, �You must not covet. the law itself is holy, and its commands are holy and right and good. Did the law, which is good, cause my death? Of course not! 22 I love God�s law with all my heart. We are not told to dismiss the law. Indeed without the law we would not know what sin is. however if we do fall into sin because of our human nature, there is a Savior, one Yshwe Messiah (known as Jesus the Christ) who can rescue us from the power of sin which causes us to disregard the law. It is our love of Christ (this sacrifice of God which showed His love for us) which gives us the power to follow the law and overcome sinfulness. It does not dismiss the law. All of God's laws are good (and for the good) of mankind... they preserve our health. At the time of the early Christians though, these two things were a stumbling block to the gentiles keeping them from coming to know Christ, so Paul helped to understand that it was not these things which were important, but the coming to Christ with one's heart. The thing we have been released from is 'the power of sin to use God's law against us', because we have the power of the Holy Spirit living within us to combat that power and to help us to follow God's law and avoid sinning. Paul never abolished the Old Law, the Old Law was never meant for Christians it was always meant as a temporary law for the children of Israel whose descendants are the Jewish people. Jesus came to fufill the law as the Jewish priests accused him of trying to change it he said I have not come to abolish the law but to fufill it which means Christ came to complete the Old Law. It was never abolished since it was never meant for Christians in the first place. The doctrine of the 'immaculate conception' has nothing to do with the virgin birth. It is the notion that Mary was conceived without the 'stain' of original sin. I can elaborate, if you wish.